The earliest diamond-cutting industry is believed to have started in Venice, Rome a widely recognised trade capital. The earliest form of diamond cutting is the point cut, with eight symmetrical facets in the shape of an octahedron. 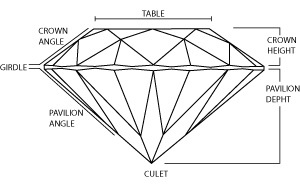 This diamond cut was later improved to a Table Cut, achieved by cutting off part of the top half at the Point Cut to create a table. These diamond cuts were later improved to include:Today’s Modern Round Brilliant Cut – 1900s. Learn about the Diamond Cutting and Polishing Process. Did you know? A diamond is the hardest mineral known to man. Find out more.